Madeline Island is by far the most well-known of the twenty-three Apostle Islands and a very holy place to Ojibwe people. Midewiwin (“Grand Medicine Religion”) prophecy sent the Ojibwe on a great migration that would end when they reached their final destination, a place where “food grows on water.” They first journeyed to Moneuang (Montreal) then to Boweting (Sault Ste. Marie). Eventually they settled on an island they called Moningwunakauning or “home of the golden-breasted woodpecker,” known to French traders as La Pointe for the fort they built there in 1693. From Moningwunakauning the Ojibwe ventured out and indeed found food growing on the water: manomin, known today as wild rice. 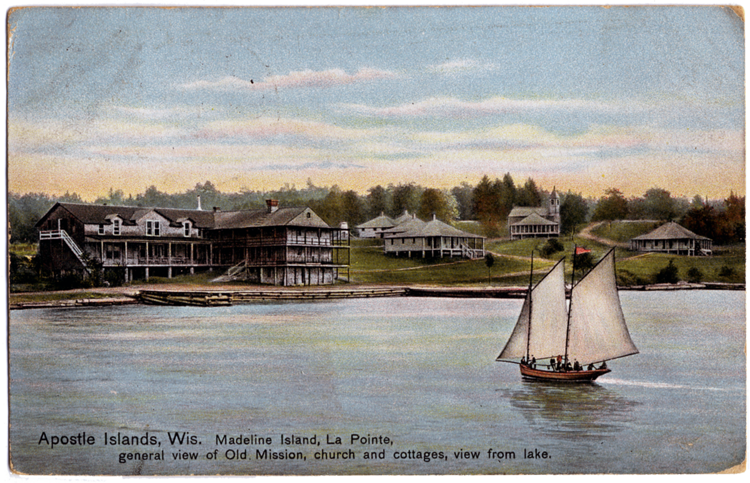 Moningwunakauning became known as Madeline Island to Ojibwe and Europeans alike after Equaysayway, daughter of Chief White Crane, married French explorer and trader Michel Cadotte, who in 1793 established a trading post at La Pointe; she was baptized a Christian and adopted the name Madeleine, and her father renamed the island in her honor (it is unclear how the spelling changed). In 1850 Benjamin Armstrong, an Alabama native who lived among the Ojibwe, heard that Washington politicians were lobbying to force the Ojibwe to move to Minnesota’s prairie country. In fact, President Zachary Taylor issued a proclamation discounting earlier treaties and told the Ojibwe to prepare to leave. Armstrong feared the Ojibwe would sooner go to war than move away from the graves of their ancestors. Meanwhile Taylor died and Millard Fillmore took his place. In 1852 Armstrong decided to take a small party of Ojibwe, including his father-in-law Kechewaishke (Chief Buffalo), to Washington to plead their case to the new administration. Despite storms of nature and bureaucracy, the group made it to Washington, only to be refused an audience with the commissioner of Indian Affairs. Back at his hotel, a dejected Armstrong found Chief Buffalo and the other Ojibwe in the center of a crowd, which included members of President Fillmore’s cabinet. The next afternoon they found themselves in the White House, sharing Chief Buffalo’s tobacco with the president in a gesture of friendship. Chief Buffalo’s spokesman, Oshaga, spoke for over an hour while Armstrong translated and the president listened carefully. Two days later Fillmore rescinded Taylor’s order with a compromise: the land would be opened for European settlement, but the Ojibwe would not be forced from their lands. In 1854 Chief Buffalo was one of the Ojibwe leaders who signed the Treaty of La Pointe, placing Fillmore’s decision into action, creating several Ojibwe reservations. Armstrong again translated for his father-in-law, who died the following year at age ninety-six.